This is a "NO SINGLE MALES" event! 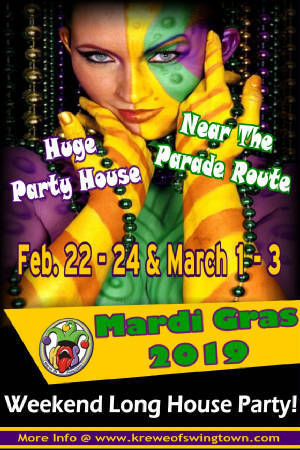 In our awesome Mardi Gras party house you will now have the option of selecting from air mattress spots, a hide-a-bed spot, semi-private and private rooms. The house has only two private rooms. The rate is good for up to 2 people only. Semi-private rooms have 2-3 Queen beds in each room and are shared with other couples for the weekend. This for a hide-a-bed spot in the party house complex! Air Mattress Spots will be located in some of the common areas of the house. Spots are for one air mattress up to Queen in size. If you have any problems or concerns please contact the webmaster on the Contacts Page. If you are mailing your payment, please send us an email letting me know your sending it so I can put you down on the list. If you do not contact us before you send your payment we can not guarantee that the spot you want will be available.